Unless you've been living under a rock, you and your grandmother know about contouring. It doesn't seem like it, but contouring is actually pretty easy once you get the hang of it and these contouring sticks by PÜR Cosmetics makes it even easier! 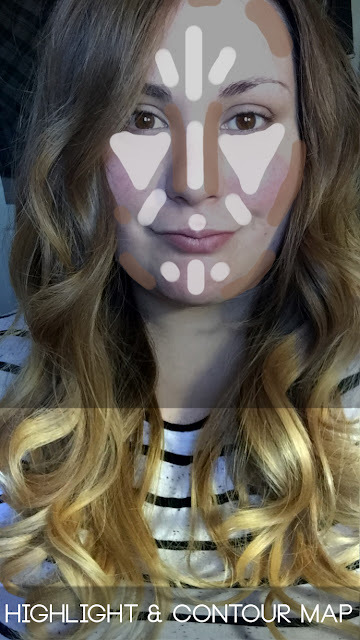 Just like any other makeup technique, contouring takes practice. PÜR Cosmetics Cameo Contour Sticks come in five different shades (Light, Medium, Tan, Deep and Dark) and each come with an amazing blending sponge and a set of instructions. These are medium-full coverage and dry to a matte/powder finish. The contour shades are cool toned which is the preferred method for contouring rather than a warm bronze shade. These come in a convenient plastic twist-tube that's small enough to carry in a makeup mag. They are creamy, pigmented and blend like a dream. When you break it down, contouring is pretty simple. All it is is adding dimension to your face. All you're doing by contouring is shading the areas you would like to recede or appear smaller. Highlighting is basically bringing forward the areas you would like to emphasize. It's literally that easy! Here's my complete bare face - no foundation, no contour, no highlight! While nothing is wrong with a bare face, adding shadows and light can greatly bring out your features. Here I map out where I usually apply highlight and contour. Depending on your face shape and what features you want to enhance or diminish, your placement might be a little different from mine. Before I contour, I like to apply my foundation first. The only problem I have with this product is that the light shade isn't light enough; it's actually about the same shade as my regular foundation! So when I use this product, I try to use a darker foundation or apply just a thin layer since the Cameo Contour sticks are pretty bendable and buildable. One of the main areas people like to contour are the cheeks. If you make a fishy face, you can make out the hollow area where you would apply the contour shade. If this doesn't work for you, you can also feel around with your fingers and you should be able to feel your cheekbone. If your forehead is on the smaller side, skip the forehead contouring. I also like to contour my nose by adding the darker shades on the sides and the light shade on the center. Lastly I contour along my jaw. I add the highlight shade where I want more light to hit and to appear brighter, so my forehead, under eyes, cupid's bow, chin and smile lines. The key to successful contouring is BLENDING. 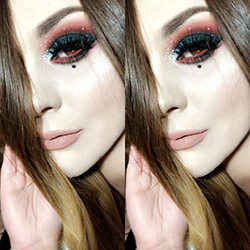 Seriously, blend blend blend! 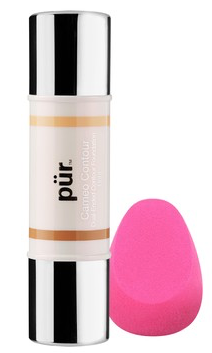 The PÜR Cosmetics Cameo Contour Stick comes with an awesome blending sponge which is really similar to the Beauty Blender except PÜR's comes with a flattened, angled area that makes it super easy to press into the skin and get into hard to reach areas like under the eye. It's best if you use it damp; just make sure you squeeze out all the excess water. I suggest blending the light shade first as opposed to the darker shade. Other wise you'll end up with dark product on your sponge and your light areas will become muddy. If you feel like some areas are too dark, simply apply the light end and carefully blend that area. You'll know you've blended properly when you can't see any harsh lines. Here's my contoured face with my eyes, lips and blush applied as well. Voila! That's all it takes and now your face should be beautifully defined and enhanced. 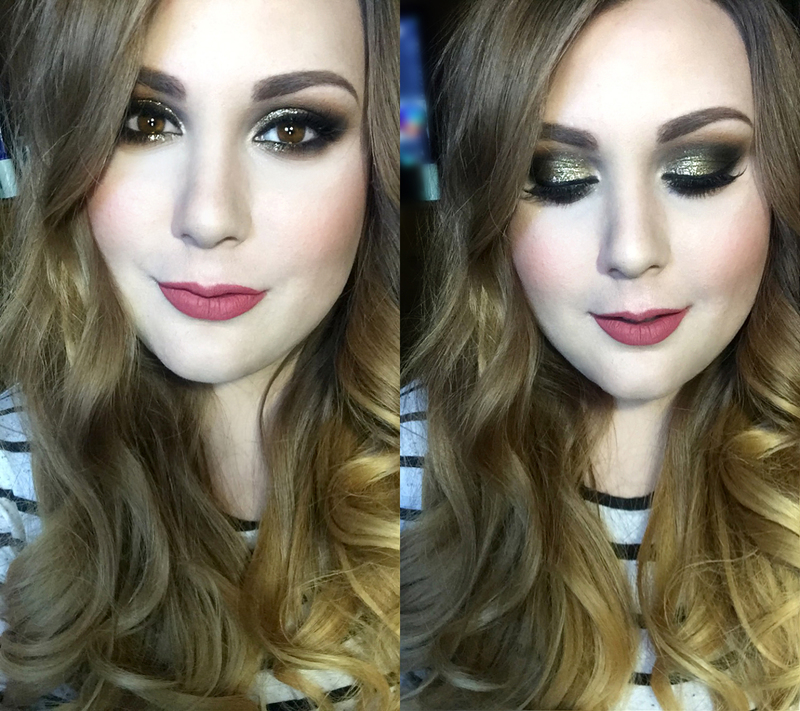 On my eyes: Makeup Geek eyeshadows in Beaches and Cream, Cocoa Bear, Corrupt and Uptopia. As for wear, I have combination/oily skin and this wore beautifully. I got a good 4-5 hours worth of wear without having to touch up. It didn't irritate my sensitive skin and they have no noticeable scent which is a plus. Since they are on the creamy side though, I do not think these would work well for me in the summer time when my skin becomes a lot more oily. But if your skin is dry to combination, then these will work well for you.